Martyn Wyndham Read can charm an audience with the range and quality of his voice. One of the most frequently requested guests he has become a firm favourite at the club. 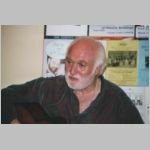 His passion for Australian songs and stories is coupled with his love of traditional material. He is also a great admirer and exponent of the late great Graham Miles material. His fund of stories are delivered with a dry wit. Again, a very popular guest so come early for a seat.